This story is part of a dandyhorse series on the need for bike infrastructure expansion in the suburbs. Read parts one and two of the series on the dandyBLOG. Illustration above by Warren Wheeler. Scarborough isn’t a place people easily associate with bicycling – but this hasn’t deterred the Toronto Centre for Active Transportation (TCAT) and its partners, Cycle Toronto and Culture Link from a new initiative called Scarborough Cycles. 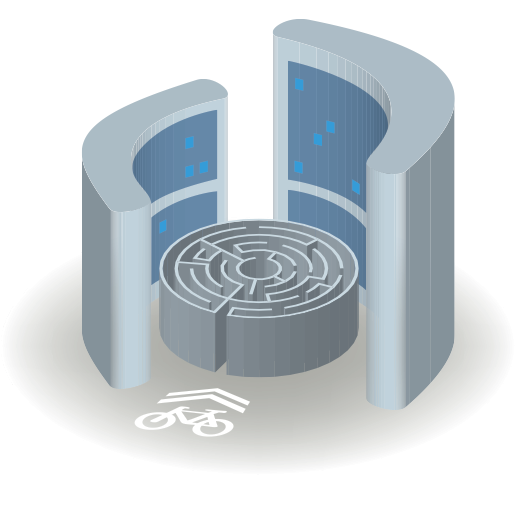 The campaign slogan: "building bike culture beyond downtown" is straight-forward and accompanies goals of improving cycling skills and developing local leadership to address barriers to cycling in Scarborough. Scarborough Cycles is partly motivated by the fact that a huge number of trips in Scarborough – an estimated half million each day – are short enough to be cycled, even though cars are the dominant choice. In Councillor Michelle Berardinetti’s Ward 35, for example, half of all car trips by drivers are under 4.6 km and for their passengers under 3.8 km. In Councillor Gary Crawford’s neighbouring Ward 36, the median trip distances for drivers and passengers are only slightly higher. This data presumably escaped Berardinetti and Crawford who eagerly presided over the removal of bike lanes in their wards during the last term in council. Scarborough Cycles, which enjoys funding from the Metcalf Foundation’s Cycle City program isn’t focusing on the councillors (who might themselves be considered barriers to cycling) but rather on the community itself to help make cycling an easier and more obvious choice. One goal of Scarborough Cycles is to establish two "Bike Hubs" – places where cyclists can go for services like borrowing a bike and learning cycling and repair skills, as well as developing advocacy skills. In central Toronto cyclists can get such help at places like Bike Pirates, Bike Chain, or Charlie’s Freewheels. In Scarborough, it’s not so easy. Marvin Macaraig, project coordinator for Scarborough Cycles, says that the huge Scarborough area has but one specialized bike store and one used bike store. By comparison, a person standing at Bathurst and Bloor in central Toronto can virtually throw a kiss at three bike stores. Macaraig is working on identifying potential locations and community partners for the Bike Hubs. An ideal location would be within one of the surprisingly many pockets of Scarborough with low car ownership levels, based on research by the Cycling Think & Do Tank. Macaraig, who is a Scarborough resident and cyclist, is trying to leverage some of the momentum generated by the recent success of the Toronto East Bicycle Festival, which drew 400 people, and the completion of cycling trails in Scarborough along the Gatineau Hydro Corridor and the Scarborough Green Loop. The focus of Scarborough Cycles is cycling for everyday transport. Lamentably, notes Macaraig, City Hall’s 2016 cycling implementation plan doesn’t include a single on-street cycling project for this suburb. One of the obvious barriers in Scarborough, as elsewhere in the city, is the absence of a safe network of routes. The Gatineau Hydro Corridor, for example, is an attractive addition for Scarborough cyclists but unless you live near the trail, the north-south roads that should provide access actually constitute barriers given their speed and width. The bike lanes on Birchmount Rd. and Pharmacy Ave., had they been extended, could have served as an access route to the Gatineau trail. (In fact, the lanes could also link to the planned Eglinton bike lanes, once the crosstown LRT is completed.) Instead, the bike lanes were eliminated under the "leadership" of Berardinetti and Crawford. The result is that the investment in the Gatineau trail will pay lower dividends because many potential visitors simply won’t have a safe route to get there. 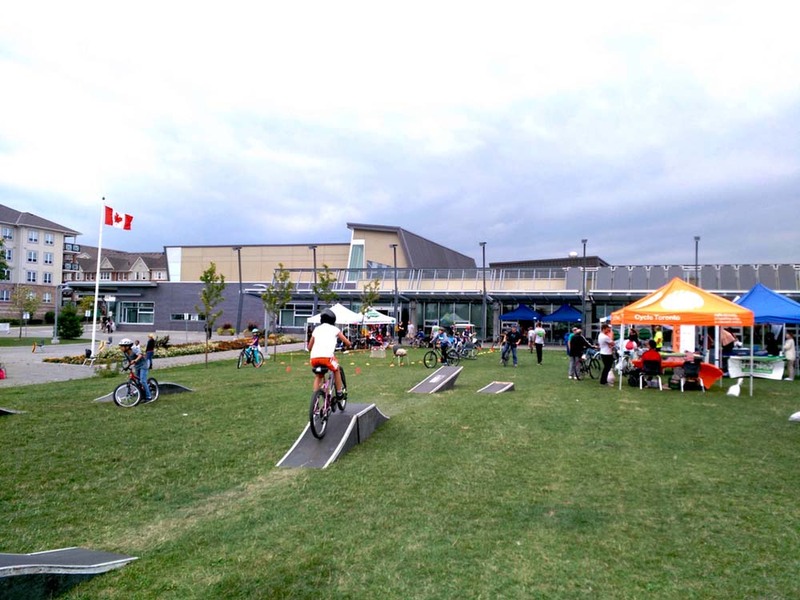 Participants at the Toronto East Bike Festival held at the Warden Hilltop Community Centre in Scarborough this past September. Photo by Marvin Macaraig. 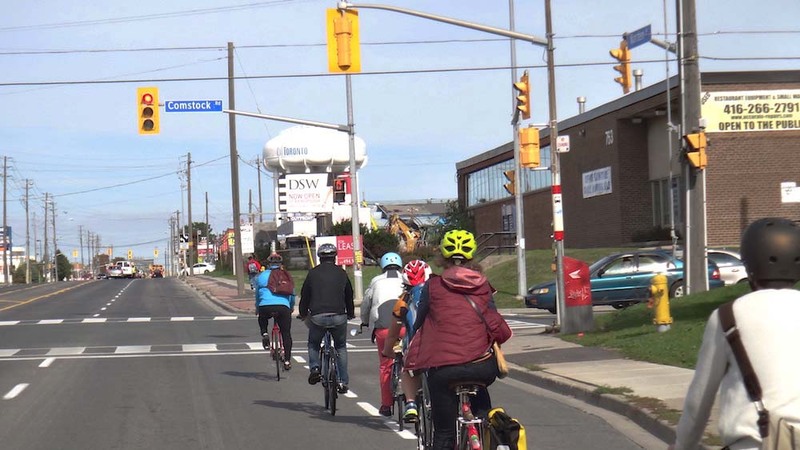 A more hopeful development in Scarborough is a newly established cycling group at West Hill Collegiate near the University of Toronto’s Scarborough campus. The student group, inspired by one of the teachers, is supported by Culture Link’s Bike to School program. Scarborough Cycles is pitching in by lending the group 16 new bikes. The group’s first ride revealed both the potential of cycling in Scarborough and the challenges. Kristin Schwartz of Culture Link participated in that first ride in Morningside Park. The students enjoyed the excursion, and left Schwartz herself marvelling at how such a beautiful forest “is right here in front of us.” The route to the park was far less beautiful. For safety reasons, the group walked their bikes on the sidewalk on Morningside Ave. – a public roadway where cyclists have the right to ride, but where their right to safety is simply ignored by planners and politicians. It’s an issue the students might want to take up once they have mastered their riding, bike repair, and trip planning skills. Macaraig believes that “a little bit of cycling infrastructure will go a long way” to further increase cycling numbers in the area. With local residents eventually leading the charge, Scarborough will one day have the infrastructure it needs to make cycling a popular everyday choice. Albert Koehl is co-founder of Bells on Bloor.